The jeweler blends her Central Asian roots with her coastal residence. We could stand to learn a few things from oysters. Like us, they builds walls. Walls that promise security, warmth. Home. But when something infiltrates that shell, be it anything from a formidable parasite to an innocuous grain of sand, the bivalve does not succumb: It fortifies. It embraces the unwanted, coating it in layer after layer of nacre until it is no longer ugly, but a beautiful reminder of its own resilience. Munika Karim, owner of Munika Karim Boutique, has mimicked the pearl. Originally from Uzbekistan, a former territory of the Soviet Union, Karim made her way to New York City 20 years ago by way of a university-issued grant. Unfortunately, life doesn’t always imitate the silver screen. Karim’s then-husband abruptly left when their youngest son was only 7 months old. After functioning as a stay-at-home mom for years, Karim knew that, somehow, the show had to go on. Karim’s pearls quickly made their way from the necks of friends to friends of friends, finally attracting the attention of national markets. With four cubs in tow, she began to learn the ropes and establish her own clientele as a jewelry vendor in the Santa Rosa Mall. This winter, Munika Karim Boutique shifted into a more central location in the Commons, occupying a snug little spot next to Hollister. As evidenced by the 600 one-of-a-kind designs that adorn the walls, it’s not your typical, touristy pearl shop. After years of sticking to the local market’s status quo, Karim realized her creations didn’t differ much from those of other pearl peddlers along the coast. “I made my little bit of money and then started traveling. I started buying pearls from Chinese farms and learned how to polish,” she said. Karim’s preferred polishing technique involves tumbling pearls with fine slivers of bamboo and natural oils, boosting iridescence as well as durability. The latter is essential to the next step of the design process, which involves placing the pearl into a specially crafted, precious-stone drilling machine. Once punctured, the lustrous pearl is threaded with fine leather and pliant to Karim’s whims. Though many find their way to rings, bracelets and earrings, customers often seek out the boutique’s signature, versatile necklace. Karim is happy to demonstrate, easily maneuvering various knots to transform a long, lariat-type necklace into a subtle, yet stylish, princess length and, finally, a striking choker. But, if you’re not partial to pearls, Karim has bedazzled many a chain with natural crystals, gems and metals. When she is not minding the shop, you can likely find Karim in her back-room workshop, clad in a surgical mask and safety goggles as she melts silver and polishes Afghan emeralds like a vogue blacksmith. She is self-taught, thanks to her friend, YouTube. When asked if she’s always had an interest in the world of fashion, Karim quietly admits that she used to be a model, but never thought she’d work at the other end of the industry. It explains her eye for unique apparel, arrayed on a wall across the store from the jewelry. 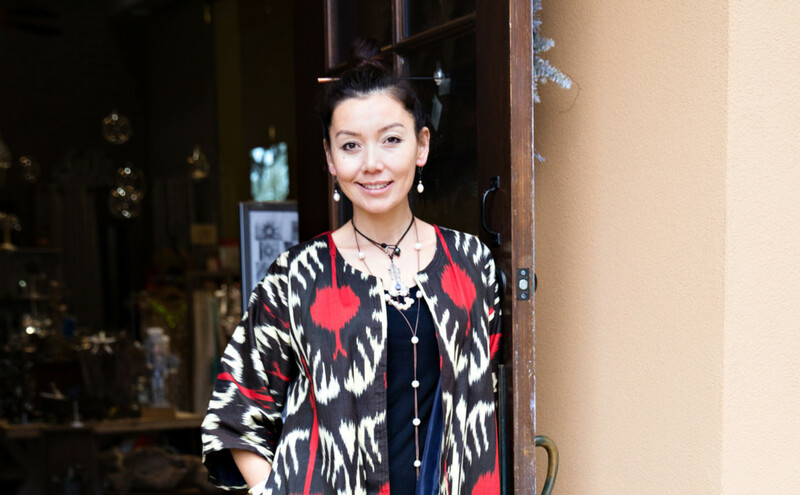 It’s no secret that Munika Karim Boutique speaks to the boho-soul. She offers a table of potted succulents and miniature Zen gardens (designed by Karim’s children) as well as a henna “tattoo” station. On this day, Karim’s hand is embellished with an intricate representation of the herb. Many barefoot brides have modeled Karim’s sandy-white henna at their beachfront weddings. Unlike many local offerings, Karim’s henna is chemical free. Henna, which is a flower, is mixed with essential oils and water, then refrigerated into a paste. Karim’s solution lasts 10-14 days before fading. “I love sharing my tradition with people, through both the henna and the Eastern influences in my jewelry,” Karim smiled. “I’m from a big city and was always surrounded by friends who shared my culture. Then, when my life completely changed, I found myself with four kids, no car, no money and no friends.